This is a free event with donations welcome to cover room cost and all profits going to the Social Bite Fund. Again we begin by organising our standing so that we are lengthened and poised (see standing blog). 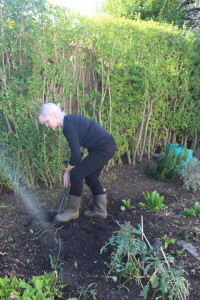 Digging, like lifting, requires bending at ankles, knees and hips while keeping our lengthened head, neck, back organisation (see photograph below left). This makes the process of digging less strenuous. 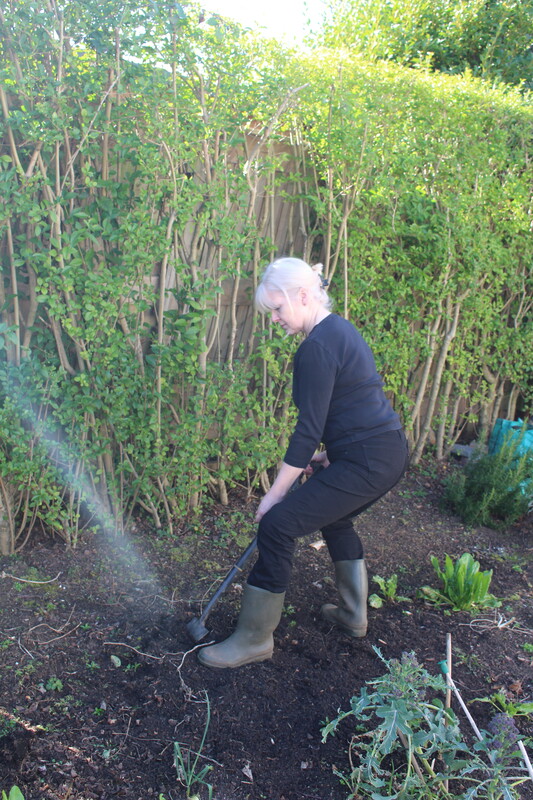 Compare this with the photograph on the right where although the knees are bent, I am bending forwards and down by bending the back and also tensing my neck as I need more effort to push the spade into the ground. This is potentially hazardous to my neck, and back. It is important to keep the length we have achieved by standing with good poise as we move into doing other tasks in the garden. Lifting: When lifting, we need to bend at the hips, knees and ankles but keep the head, neck, back relationship as it was when standing (see photograph to right). 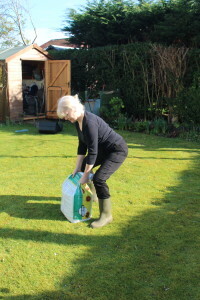 This organisation allows us to use the support from the ground through our feet (see standing blog) and consequently through our backs to aid the lifting process. If we do not organise ourselves well when lifting we can cause excessive strain on necks, shoulders and back. 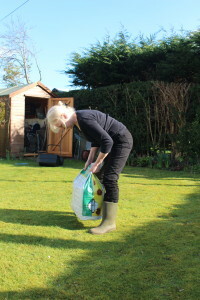 Not bending sufficiently at the ankles, knees and hips has lead to bending and strain in the shoulders and upper and lower back in the photograph below. 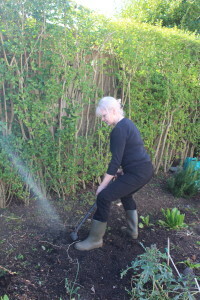 The gardening season is getting underway and it seems timely to give some tips on how to look after yourself when gardening. I will talk about a different task in each blog. 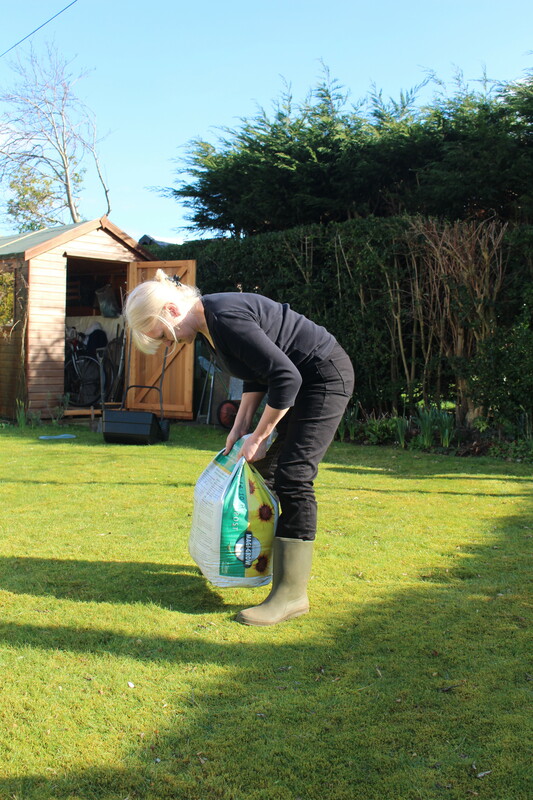 It is important to be able to stand with a relaxed poise and lengthened spine before you start. 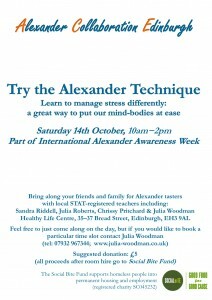 This takes practice and for many people, Alexander Technique lessons are needed to provide the awareness required and experience of standing effortlessly. However, I aim to show poor use and good use when standing. When standing we can find our full height, not by bracing and pushing up but simply by learning not to pull down which is what most of us do most of the time. The picture on the right shows our tendency to pull down, giving rounded shoulders and a tendency to pull the head back (causing neck and back tension) as well as unnatural tilting of the hips and bracing in the back and legs. We need to notice when we do these things as through habit they will feel completely normal and right. We need to want to change this. Observe what other people do and then yourself. Tell yourself to stop pulling down but do not try to do anything, stop tensing the neck and think up away from your feet with the top of your head, eyes facing forward. Your weight should be going through the front of the heel pad and then spreading through the foot. Being able to return to a relaxed but lengthened standing position during gardening sessions is essential as it is the starting and ending of most of the movements that we will do. 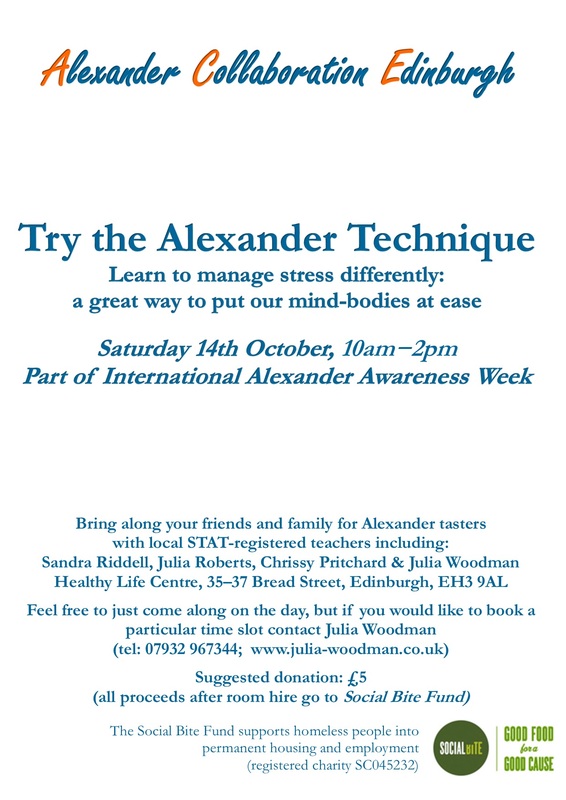 Many people who practise the Alexander Technique view it’s founder, Frederick Matthias Alexander as a man before his time. He was in effect an observational scientist in his approach to his own use and medical problems. The resulting Alexander Technique being the result of years of making changes in his own use, constantly thinking about his use and observing the outcome, then evaluating the results and finding ways of testing further ideas on how his use could improve. Improvements in his own health and subsequently those to whom he taught his technique confirmed his ideas. Today, when applying the technique, I teach in a similar way, applying the principles discovered by Alexander but constantly observing and evaluating my own and my pupil’s use. The idea that changing ourselves through our thinking when the thinking is directed to a positive change e.g. freeing the neck and therefore lengthening the neck and back, is a powerful tool that we all possess but do not always use. Read ‘Constructive Conscious Control of the Individual’ by F.M. Alexander. 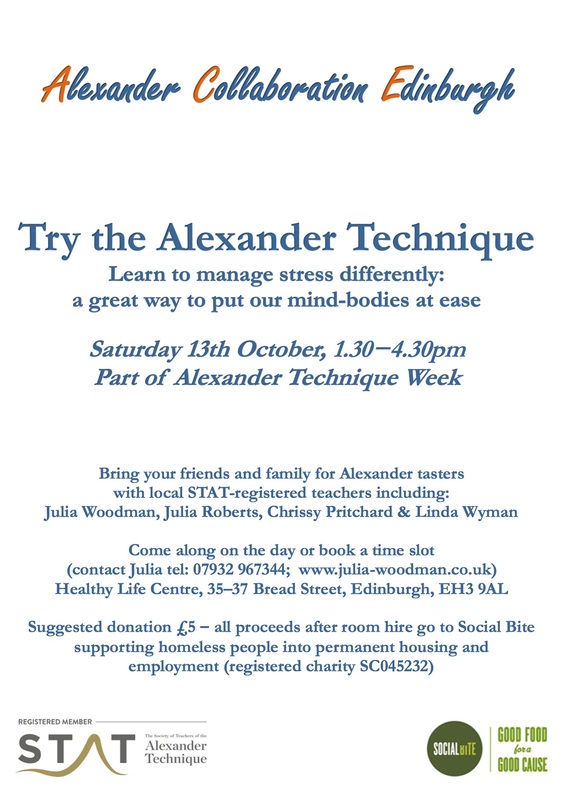 It has been with interest that several health related articles in the common press have struck a chord with Alexander’s ideas and teaching. In June 2013 a report in The Times ‘Why technology puts young spines at risk‘ by Rachel Carlyle, describes how chiropractors and osteopaths are reporting a huge increase in the number of children complaining of chronic neck, shoulder and back pain. The article describes how a spine is distorted from its normal elongated ‘S’ shape by sitting badly hunched over a laptop, tablet or smartphone for hours at at time. I have strong feelings about this having been a secondary school teacher and had many children complain of a bad back and observed their poor posture. STAT has school chair campaign to improve chairs for children www.stat.org.uk and has ongoing contact with several schools. 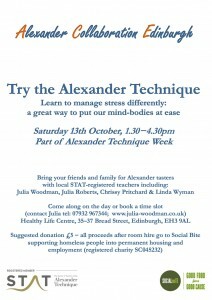 However, for the health of our children there needs to be across the board education of how to sit and work at a desk or computer or laptop with what Alexander calls ‘ good use of the self’. This could be so easily done during PSE or similar classes and there are many Alexander Technique teachers who could help with this.